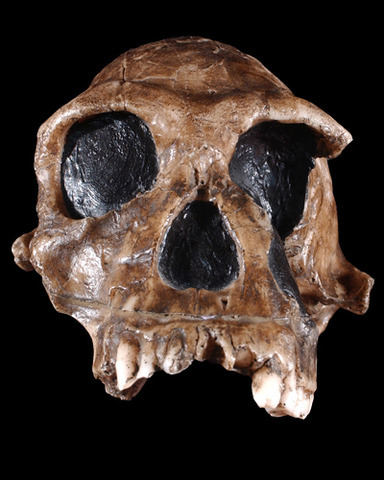 KNM ER 1813 a relatively small cranial capacity (510 cc)1 compared to other Homo habilis specimens. The left side of the face has been crushed although the right side is fairly complete. The face of KNM ER 1813 is rather short, exhibits relatively reduced subnasal prognathism, and small teeth (particularly the cheek teeth)1,2. The frontal rises steeply, the palate is long and parabolic shaped, and moderate postorbital constriction is present2. Johanson, Donald and Blake Edgar. 2006. From Lucy to Language: Revised, Updated, and Expanded. New York: Simon and Schuster. Schwartz, Jeffrey H. and Ian Tattersall. 2003. The Human Fossil Record: Craniodental Morphology of Genus Homo (Africa and Asia). Volume 2. Hoboken: Wiley-Liss. Gathogo, Patrick N and Francis H. Brown. 2006. Revised stratigraphy of Area 123, Koobi Fora, Kenya, and new age estimates of its fossil mammals, including hominins. J. Hum. Evol. 51(5):471-479.